I have been doing some looking around dance videos on U tube, and i keep running across various dances by native siberian peoples. Although they look very similar, they are attributed to different national groups. I have recently figured out that many of them actually represent one group, the Koryak, and perhaps the Itelmen. These are two seperate, but closely related peoples, The Itelmen live on the main body of the Kamchatka peninsula, and the Koryak live on the ithsmus that connects it to the mainland. 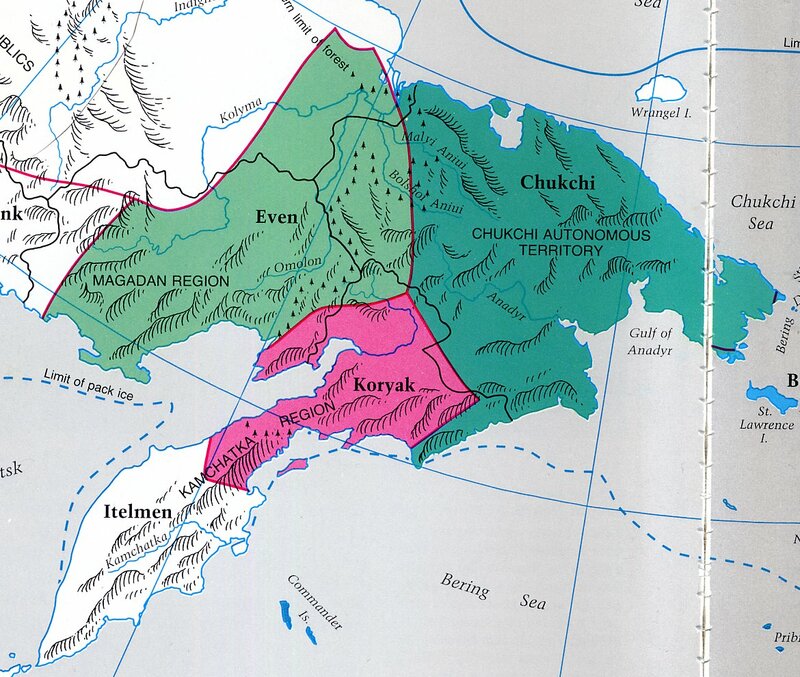 Here is a schematic map of the eastern tip of Siberia, showing the native peoples. I will cover the clothing, dance and embroidery of the Koryak. I have very little information as to the material culture of their neighbors to the south, but some of the videos that i will post links to are claimed by both of these peoples. If an Aliutor, Koryak or Itelmen can provide me with more information, i would be very grateful. Both are outnumbered in their native territory by Russians, which is true for many indigenous peoples. Here is the flag of the Koryak Autonomous Okrug. 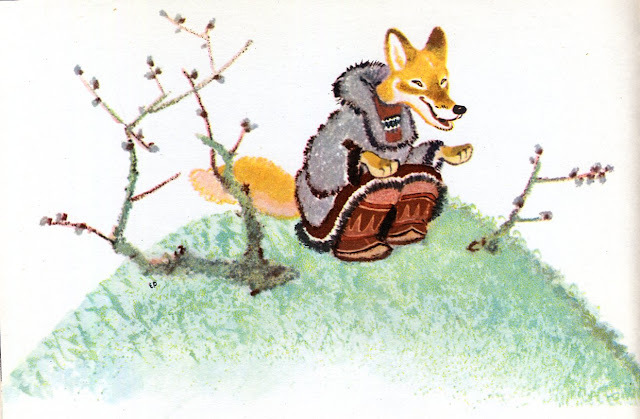 The Koryak have no indigenous textile tradition, but they do have a very rich tradition of working with fur, as many of the northern people do. The men and women basically wear the same thing, a parka like shirt with a hood, and often a bib flap in front, baggy pants and boots. The men's being more often belted, and the woman's shirt being longer, more like a dress. Here is a video make in Yakutia, performed by an Evenk youth group, doing a Koryak dance in Koryak costume. The tendency of the various indigenous groups to perform each others dances is one source of the confusion concerning these videos. 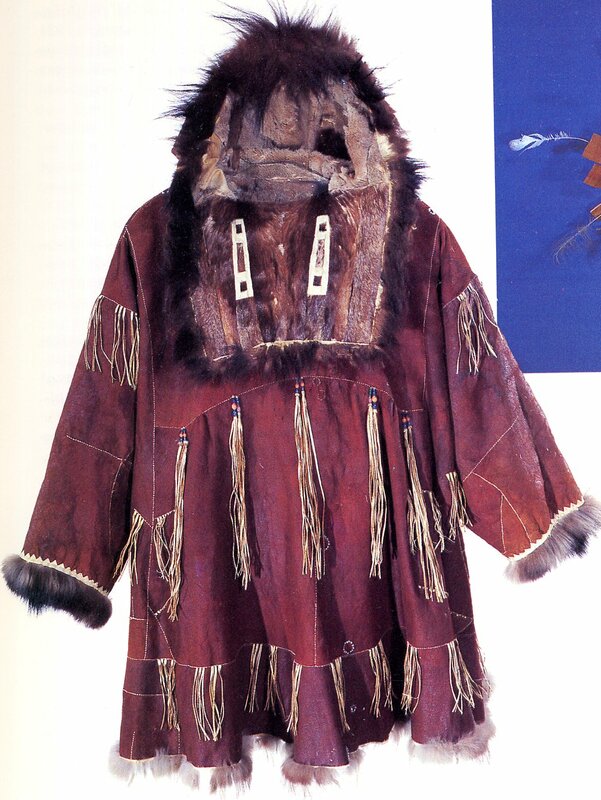 Here is an Image of a Koryak man's outfit. It is a dance/festival oufit, and is more highly ornamented than usual. This one has no hood or bib flat. The ornamented and beaded boots are typical for most of the indigenous peoples of Siberia, although they differ in detail My source suggests that it might actually be Aliutor. Some collectors were less than exact when documenting origin. 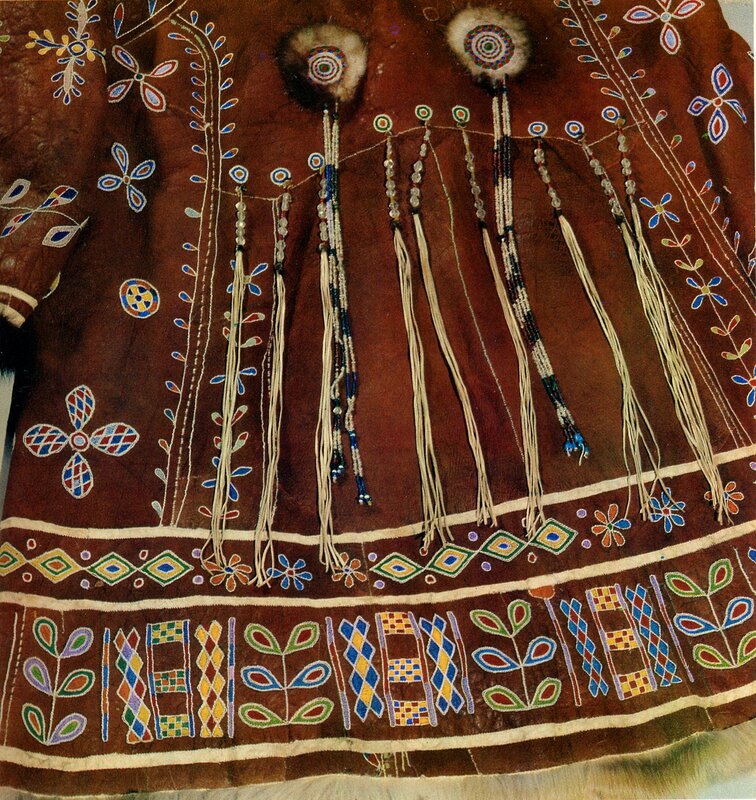 Here is an example of a woman's dance coat/dress. 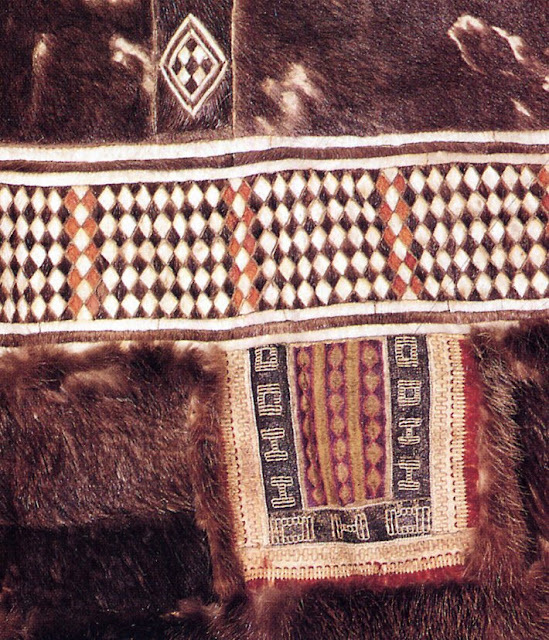 The beaded fringes are part of the traditional Koryak clothing. You will notice them on the various videos. Here is another video of Koryak Dancers. 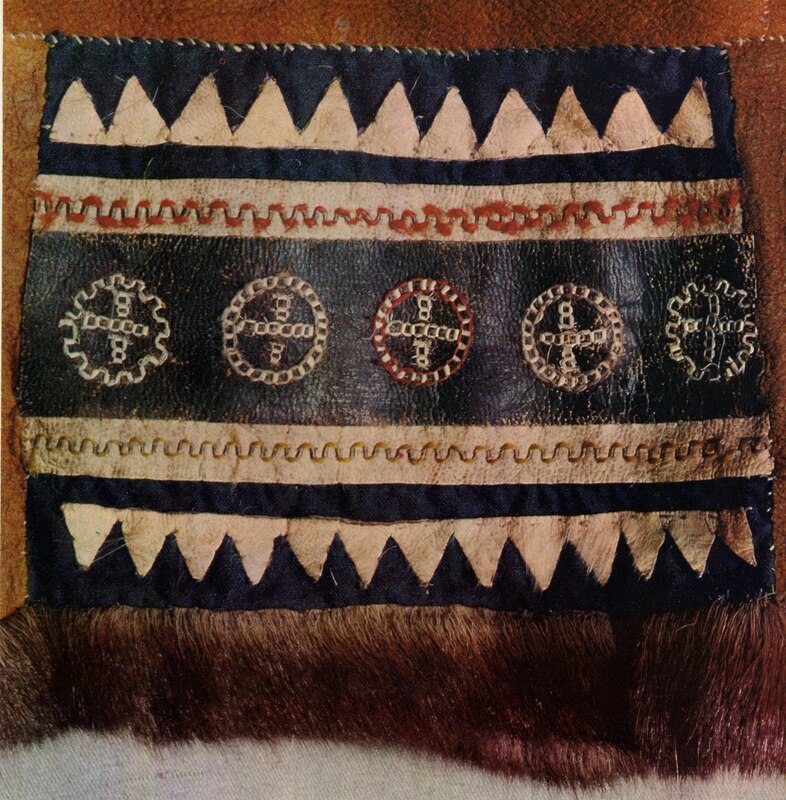 I am not sure about the first group, they might be Itelmen, or even Aleut, Their shirts resembe the seal-gut shirts of the Aleut. They are very different from the Koryak type. The second group are better dancers, and are definitely wearing Koryak outfits. Look for the bib on the front, and the beaded fringes. The women come in about halfway through. One of the men is wearing a cloth shirt which appoximates the fur one. 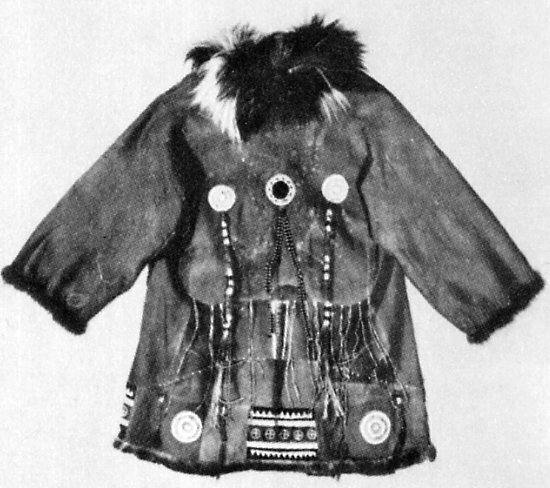 This became common as summer dress among many of the indigenous peoples. The same group explaining their costumes. 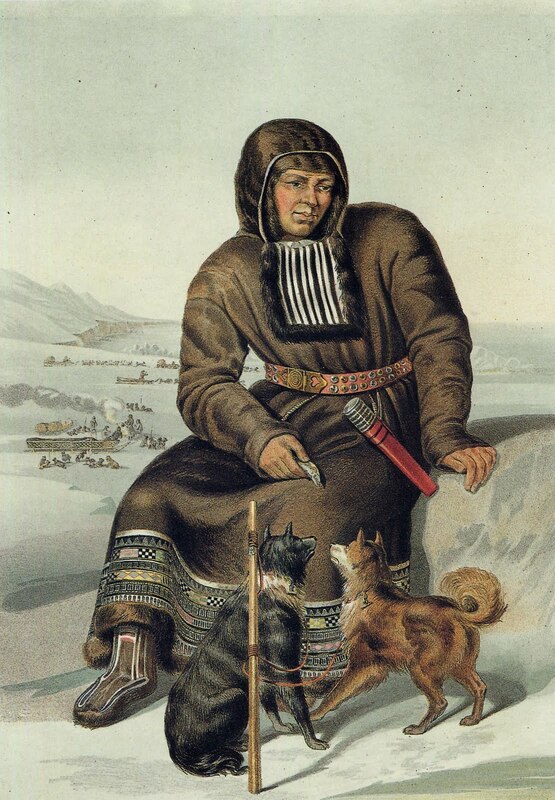 Here is a depiction by the artist Gustav-Feodor Pauli from the album 'Peoples of Russia' published in 1862. He calls this image 'Kamchadal', which just means inhabitant of Kamchatka. You can see that it is essentially the same outfit, but he makes the coat very long. The hood and the bib flap are so much part of the Koryak costume that they are clearly shown in this illustration from a book of Folk tales of Siberia, to accompany a Koryak story called Foxy Vixen. Here is another woman's coat/dress for a festive occasion. 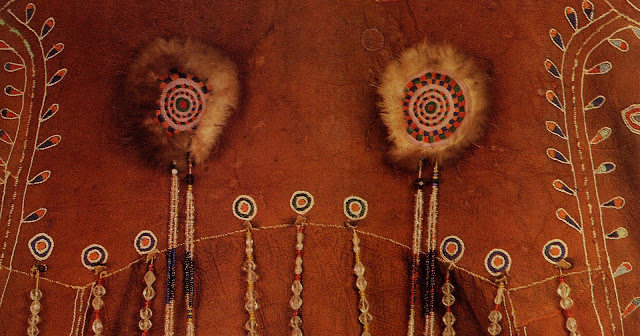 You will notice the beaded fringes, a prominent part of Koryak costume. This one has the fur on the inside. It is also richly embroidred. Here is a closeup of the ornamentation on the back. Again, note the beads, fringes, and in this case, lavish embroidery. The beaded fringes are often anchored in ornamental circles, as shown here. You will see these in several of the videos, forming a prominent feature of Koryak dress. Here is a back view of a man's festive coat, showing the fringes rooted in circular motifs. In the video above, one of the young men had similar ormamentation on his garment. There is an applied patch with applique and embroidery close to the bottom hem. Here is a closeup of it. 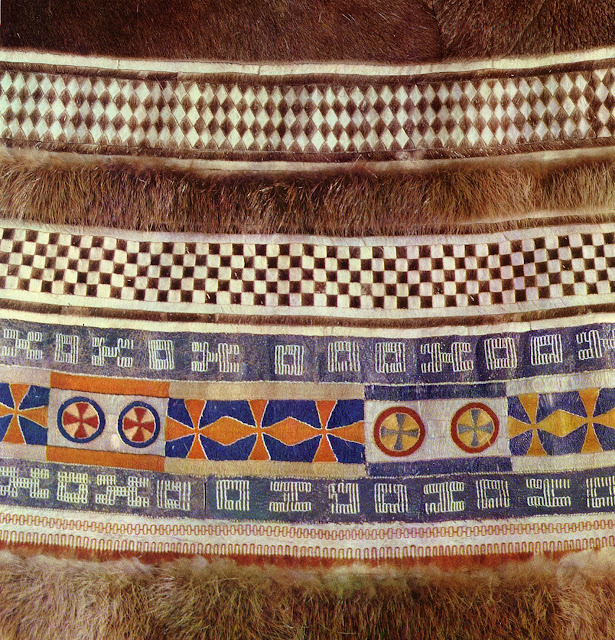 Notice the older form of embroidery, made up of strongly linear designs, made up of squares and rectangles. This type of design recurrs over and over in north Eurasia, showing up in Chuchki and Evenk bead work and even Saami [Lapp] pewter embroidery. The floral work seen above is a more recent development, or perhaps shows more east asian influence. Here is another example of the linear embroidery, combined with yet another recurring ornament found in Siberia, fur mosaic or patchwork. The linear designs are very clear in this one. The fur mosaic takes advantage of the white belly fur of the reindeeer, piecing it together with the dark upper fur to make patterns, in this case, diamond shapes. Some of the other Siberian peoples do much more complex designs. This is the hem of a man's garment. Here is the layout and composition of the garment. 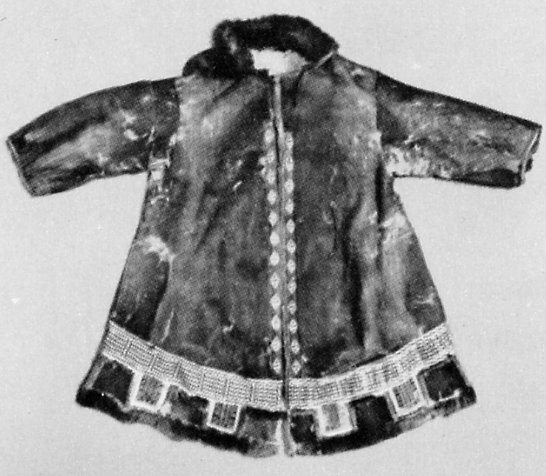 Notice that this garment is sewn fur side out. Here is one more example of a man's garment, and the detail of the hem ornament.This is a particularly fine example. Thus we see that even a people with no tradition of woven cloth because of their native climate, can still have a very rich and beautiful textile tradition. The beads were obviously obtained by trade, ulitmately either from the Russians or the Chinese, but this indigenous people took them and made their own distinctive display of daily beuty from their work. Here is yet a different performing group showing the Koryak Costume. And one more, perfoming a lyrical spring dance.This group is only referenced as being from Chukotka, but it also shows the Koryak costume. 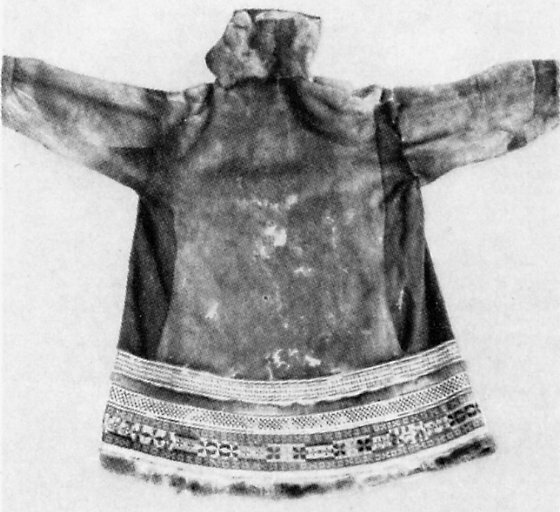 I read some of your blog and I like the effort you put into making your posts about clothing, especially that used by indigenous people of Siberia! mY ancestors are indigenous of Siberia, and I appreciate your blog. Would love to share this wonderful blog page on facebook - very interesting - people should be aware of this Indigenous culture, very colourful, much like our North American Indigenous people. Thank you for your interest, and feel free to share links with this or any of my articles.